The prayer resonated in my heart at the time and it still does. “Ridiculous” is not a term of flattery. Unfortunately, I fear there’s more of it in all of us than we’d like to believe, especially when it comes to living as a disciple of Christ. As much as I hate to admit, I know there’s far too much in me. Followers of Jesus do what He did. Jesus fasted, spent hours in quiet prayer and meditation with His Father, and loved sinners like me. He embraced the lost and the prodigals and called them to come home to their Heavenly Father. Jesus loved and spent time with thieves, drunkards, and people trapped in all kinds of sexual sin. He loved them and when He told them to stop their sin they did. Why did they change? Because they knew they could trust Him. They knew He loved them as they were but wanted more for them. He invited them to know their Heavenly Father, inspired them to choose a different life, and He helped them to change. He had both the power to forgive sin and the willingness to forgive it. No matter what. He still does. Do you know who didn’t change? The Pharisees. The people who were a part of the religious establishment heard Jesus’ words and said, “I’m not doing that.” They did the things people could see – fast, go to church, make public donations – but they didn’t love the lost. They didn’t embrace the unlovely or spend time with the people trapped in a lifestyle of sin. They didn’t want to do any of those loving acts, so they didn’t. The Pharisees (the most religious people in the country) were hopelessly trapped in a lifestyle of prejudice, hate, and unrepentance. I do not want to be a Pharisee. There was a time when I was the person trapped in a sinful lifestyle. I was miserable but I couldn’t figure out why I wasn’t happy. People probably didn’t want to spend much time with me either for fear my sin would rub off on them. I thank God for the people who cared enough to point me to Jesus. They kept on pointing me to Him until I saw my sin as He saw it, repented, and asked Jesus to save me. I shudder to think where I’d be if a few followers of Jesus had not loved sinners like me. Our world is full of people trapped in darkness, trudging through life with a crushing burden of sin. They’re waiting for someone to love them out of the darkness and into the light but most of them don’t even know it. We can be the light bearers. The way-leaders. 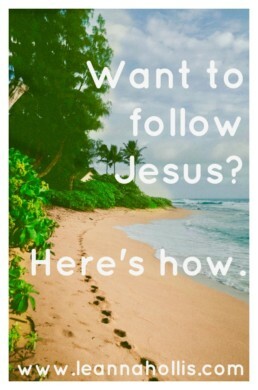 If we’re a follower of Jesus, it’s not optional. The life of a disciple is not about what we want or what the world offers. It’s about Jesus and what He wants. “Christian” and “disciple” should be synonymous. If we are Christian, we live as a disciple. It’s that easy. It’s that hard. Disciples abandon our ridiculousness, embrace our Savior who loves us all, even when we’re unlovely, and love the ones Jesus loves. It’s what we’re supposed to do, how we’re supposed to live. We trade “I won’t” for “I will” and follow Him even when it’s hard. Leannahollis.com is a participant in the Amazon Services LLC Associates Program, an affiliate advertising program designed to provide a means for sites to earn advertising fees by advertising and linking to amazon.com. This blog post contains affiliate links, which means if you click on the link to make a purchase, I may make a small amount of money (usually a few cents) from your purchase. It will not increase the price you pay in any way. Thanks for sharing your time with me today! I’ve glad you stopped by. If you enjoyed this content, follow me on Facebook, Twitter or Pinterest or sign up for the twice-monthly mailing list (below) to be notified about my future blog posts. Before you leave, would you mind taking a moment to pin to Pinterest and share on social media? It helps extend my digital reach in ways I can’t do myself. Thanks again! See you soon. Will We Make Room for God in Our Lives?